MUCH easier to cook than it sounds! In a hot pan, place the coconut oil, beef, garlic and spinach portions and around ½ cup of hot water. Cook the spinach until it’s completely defrosted and set to a low heat. Add another ½ cup of water and reduce down again for 5-6 minutes. Meanwhile, crush your brazil nuts with the back of a spoon and take some fresh thyme leaves from the stems. 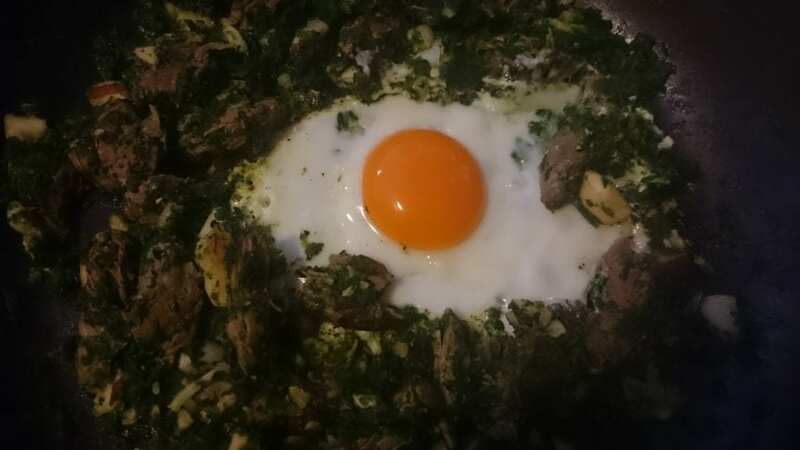 When the water has evaporated again, pull the beef into smaller pieces, place the egg in the centre of the pan and cook until all white is set. Take off the heat, season well and serve.